CLEVELAND (AP) -- Kris Bryant started to smile even before he fielded the ball. And with his throw to first for the final out, the agonizing wait 'til next year was over at last. "It happened. It happened. Chicago, it happened," first baseman Anthony Rizzo said after gloving the ball for the final out. "We did it. We're world champions. I tell ya, we're world champions. I can't believe it." Rizzo put that final ball in his pocket as the Cubs piled up in the middle of the diamond, David Ross got carried off the field by his teammates and Bill Murray partied in the clubhouse. And the whole time, blue-clad fans who traveled from Wrigley Field filled nearly the entire lower deck behind the Chicago dugout at Progressive Field, singing "Go, Cubs, Go!" in rain. They held up those white flags with the large blue "W'' on a night many of their forebears had waited for in vain. Lovable losers for generations, the Cubs nearly let this one get away, too. All-Star closer Aroldis Chapman blew a 6-3 lead with two outs in the eighth when Rajai Davis hit a tying, two-run homer. "I think about so many millions of people giving so much love and support to this team for so many years," said owner Tom Ricketts, who family bought the team in 2009. Manager Joe Maddon's team halted the longest stretch without a title in baseball, becoming the first club to overcome a 3-1 Series deficit since the 1985 Kansas City Royals. "This is an epic game. It's epic. 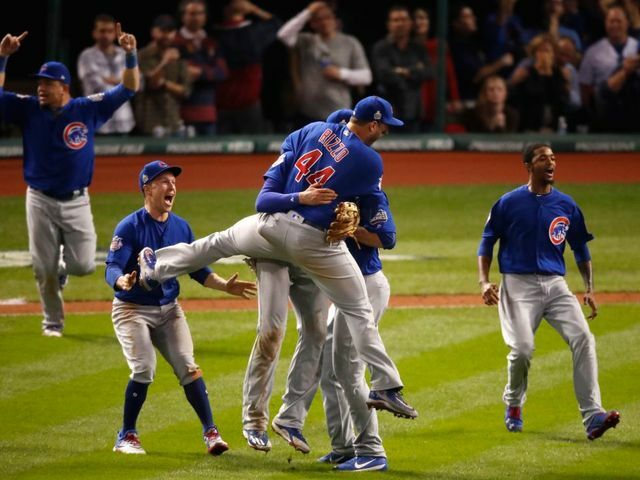 I can't believe we were able to do it - 108 years in the making," Zobrist said. "We did it." "They never quit, either," Zobrist said. "They kept coming at us." The Cubs then ended more than a century of misery for their loyal fans - barely. Bryant, one of Chicago's young stars, began to celebrate even before fielding a grounder by Michael Martinez to third base and throwing it across to Rizzo for the last out. "It's the best rain delay of all-time," Rizzo said. "We don't need a plane to fly home," Epstein said. "It's fitting it's got to be done with one of the best games of all time." Cubs outfielder Jason Heyward had called a meeting during the rain delay, talking to his teammates in the weight room. "I just had to remind everybody who we are, what we've overcome to get here," he said. While Cubs fans hugged with delight, there was only despair for the Indians, who now have gone longer than anyone without a crown. In the Indians' previous World Series appearance, they were a double-play grounder from winning the 1997 title before losing Game 7 in 11 innings to the Marlins. Earlier this year, LeBron James and the Cavaliers ended Cleveland's 52-year championship drought by overcoming a 3-1 deficit to beat Golden State for the NBA title. James and teammates were in a suite, rooting hard, as the Indians absorbed the same blow as the Warriors. Dexter Fowler homered on Corey Kluber's fourth pitch of the game, 23-year-old Javier Baez and the 39-year-old Ross - set to now retire - also went deep for the Cubs, who led 5-1 in the fifth inning and 6-3 in the eighth. Chapman wound up with the win, and Montgomery got one out for his first save in the majors. Bryan Shaw, who gave up a leadoff single to Kyle Schwarber in the 10th, took the loss in just the fourth Game 7 that went to extra innings. Albert Almora Jr., pinch-running for Schwarber, alertly took second on Bryant's long fly to center. Rizzo was intentionally walked, and Zobrist slapped an opposite-field double past a diving third baseman Jose Ramirez. Montero singled to make it a two-run lead. Even a dedicated White Sox fan could appreciate the victory. "It happened: @Cubs win World Series. That's change even this South Sider can believe in. Want to come to the White House before I leave?" President Barack Obama tweeted. 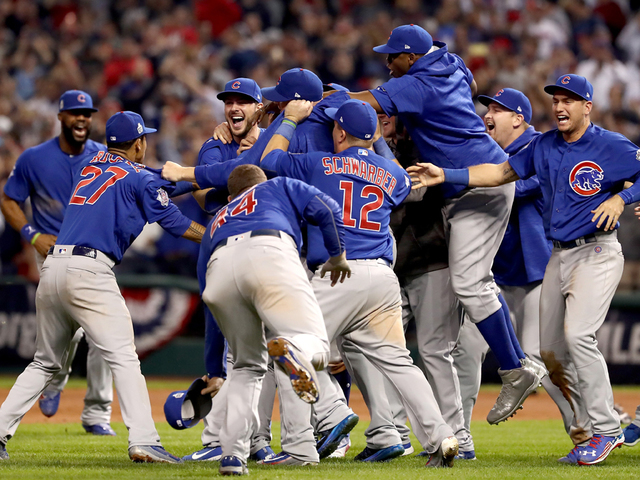 Twenty-one other teams had won the World Series since Cubs last were champions. They reached the top again on the 39,466th day after Orval Overall's three-hit shutout won the 1908 finale at Detroit in a game that took 1 hour, 24 minutes - this latest Game 7 lasted 4:24, not including the rain delay. Back then, Theodore Roosevelt was president, New Mexico, Arizona, Alaska and Hawaii were not yet states, and the first Ford Model T car was two weeks old. This was the first World Series in which no starting pitcher got at least one out in the seventh inning, according to the Elias Sports Bureau. The only other in which no starter finished at least seven innings was in 2002, when San Francisco's Russ Ortiz threw 6 1/3 innings in Game 6.